Panaji, July 17 (IANS) All 38 sitting MLAs as well as four members of Parliament from Goa cast their ballots on Monday for the President’s election, Legislature Secretary N.B. Subhedar said. “It was 100 per cent voting,” he said. 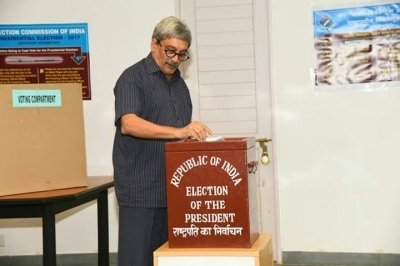 While Chief Minister Manohar Parrikar, still a Rajya Sabha MP from Uttar Pradesh, voted here, three MPs from the state — Union Minister Shripad Naik, South Goa MP Narendra Savoikar (both from the Bharatiya Janata Party) and Shantaram Naik (Congress) — cast their votes in New Delhi. “The votes cast in Goa will be sent to Delhi for counting,” Subhedar said. Goa has a 40-member assembly, but currently has 38 MLAs. Parrikar and Health Minister Vishwajit Rane are all set to contest the coming by-elections to two assembly seats.